Two Sea Turtles Found In a Single Week! Many people are not aware that sea turtles can be found in BC waters, but occasionally we do get visits from these ancient marine reptiles. Giant leatherback sea turtles occur here naturally, but are critically endangered so very few people are lucky enough to spot one in the first place. In the summer months, leatherbacks migrate from their tropical nesting sites to feed on jellies in higher Pacific latitudes, and they have a number of physiological adaptations to survive in cold water. While leatherback numbers are very low, the BC Cetacean Sightings Network does get 2 or 3 sightings each year. Suprisingly, in one week, two sea turtles washed up on beaches in Pacific Rim National Park. Neither were leatherbacks, but rather an olive ridley and a green sea turtle. While olive ridleys and greens have been found in the Pacific Northwest, they do not have cold water adaptations the way leatherbacks do. These “incidental” turtles may have ended up out of their range by following food, warm currents, or simply getting lost during their migration. Due to cold water, the turtles typically go into “cold-shock” and their metabolic and motor activities becomes severely depressed. This put them in a precarious position to avoid threats such as boats and predators, and can result in injuries causing death. 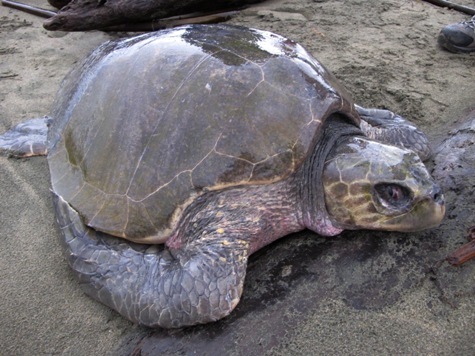 An olive ridley sea turtle was found on November 22, 2011 washed up on Long Beach near Tofino, which is the first documented sighting of an olive ridley in BC! They have been seen in Washington and Alaska, so scientists have assumed that they must pass through BC from time to time. This turtle was alive but had sustained serious injuries to its shell which had even perforated into its body cavity. Parks Canada and DFO Marine Mammal Response Network officials transported the turtle to the Vancouver Aquarium for treatment and further examination. The turtle was identified as a sub-adult female, and although an electrocardiogram detected a weak heartbeat, it was extremely infrequent. Despite efforts to re-hydrate the turtle and gently warm her body temperature, she was pronounced dead the next morning. A necropsy revealed that she had died of blunt force trauma from an unknown source. Two small pieces of hard plastic were also found in her stomach- a reminder that marine debris is a serious threat to marine animals. 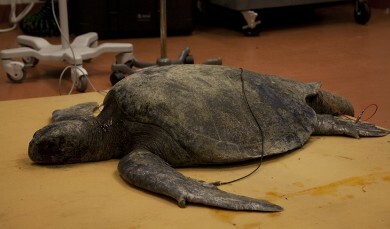 Eight days later on November 30, 2011, a green sea turtle was found off Combers Beach in Pacific Rim National Park. Parks staff were notified and the turtle was transported to the Aquarium with the help of DFO. This turtle appeared to be in better shape than the olive ridley, with no obvious external injuries. Vancouver Aquarium veterinarian Dr Martin Haulena administered fluids and antibiotics, and again looked for a heartbeat. Unfortunately, this turtle did not survive the cold shock either and was pronounced dead on December 5, 2011. Olive ridley sea turtles are the smallest sea turtle species and widespread in tropical waters around the world. In Pacific waters, they nest in Central America and Mexico and have been found to migrate as far south as Peru. They can dive up to 150m in search of crabs, sea urchins and other benthic creatures and also roam the open ocean in search of sea jellies. Olive ridleys can be identified by the number of costal (side) scutes on their shell. 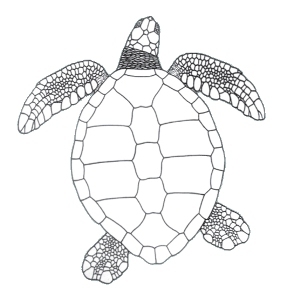 They usually have 6 to 9, which is much more than any other sea turtle (see diagram on the right). Their shells are as wide as they are long and are highly domed. Green sea turtles are the largest of hard-shelled turtles (leatherbacks are not considered hard-shelled) and are commonly seen in southern temperate waters around Mexico and Hawaii. Green turtles are unique because their diet changes as they age. Juveniles are invertivores, feeding mainly on jellyfish and other invertebrates. Adult green turtles are the only turtles that are exclusive herbivores, feeding on kelp, sea lettuce and algae. It is thought that this diet imparts a greenish colour to their skin and fat, giving them their name. 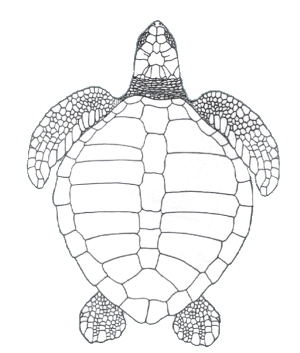 Greens have 4 costal scutes , and their shells are tapered at the rear (see diagram on the right). Their heads are also smaller compared to other sea turtles. Sea turtles worldwide face serious threats to their survival. Habitat destruction and illegal harvesting of eggs and turtles still occur despite efforts to protect nesting beaches. 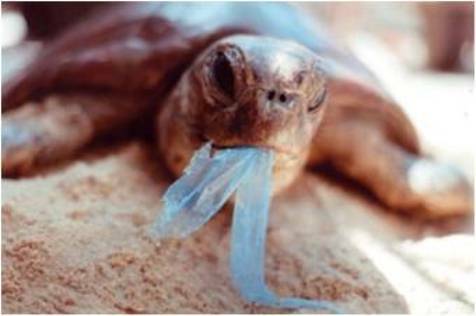 Entanglement in fishing gear, pollution, and especially ingestion of marine debris have all lead to dramatic decline in sea turtle populations. Sea turtle species range from threatened to endangered in various part of the world. You can directly participate in sea turtle conservation by reporting any sightings of sea turtles and cetaceans to the Vancouver Aquarium’s BC Cetacean Sightings Network at 1-866-I SAW ONE. Reports of dead, injured, and distressed marine mammals and sea turtles should be reported to the Marine Mammal Response Network at 1-800-465-4336. Olive Ridley sea turtle found on Long Beach, near Tofino. Olive ridley sea turtle. This species has 6-9 scutes (side plates) on each side of their shell. Their shells are as wide as they are long. Green sea turtle. This species has 4 scutes (side plates) on each side of their shell. Their shells are tapered at the end and their heads are relatively small compared to their body size. The B.C. Cetacean Sightings Network is partially funded by the Government of Canada. Le Réseau d’Observations des Cétacés de Colombie-Britannique a été réalisé avec l’appui financier partiel du gouvernement du Canada.